Family Bible Camp was always right up there with Christmas and my birthday as one of those special events that I looked forward to all year long. 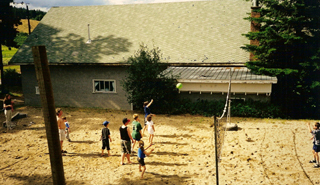 Our family first went to the Free Methodist Family Camp in Winfield, British Columbia, when I was perhaps 7 or 8 years old, and we went every year thereafter until I was grown and moved away to go to university. I also went to Christian Youth Crusaders Camp every year from ages 9 through 14, and then to Inter School Christian Fellowship camps and Free Methodist Youth camps in my teen years, at the same facility. In my adult years I attended at least one Women’s Retreat, and various family reunions and similar events there. And in the summer of 1999 I once again attended Family Camp, this time with my children; and continued to attend most summers since, until the sad news was announced that the Camp was being leased to another group this past summer. I felt like a big piece of my life had just dropped away! In my young years the camp was composed of a big old kitchen/dining room building, with an office tacked on the end; a large echoing building, the “Tabernacle,” with a stage at one end, which had once been an activity center for a Boy Scouts camp; and a scattering of cabins, some privately owned, some given to the camp, and all meant only for summer camping. It was pretty much a “roughing it” camp in those days, but we didn’t mind! Later, in 1967, the Free Methodist Church Conference, as a Canadian Centennial project, tore down the old dining hall, and replaced it with a new, larger kitchen/dining hall, including a fireplace and lounge area at one end, and upstairs a new office, another lounge area, and 10 bedrooms. Though simple in construction, it felt like a mansion to us! And the camp even got an official name, “Pine Grove Free Methodist Camp.” Later, Youth With A Mission (YWAM) rented the camp facilities for several winters as a training center, and instead of paying rent, they winterized the cabins, built new ones, and constructed an RV and tenting area. They also built new washrooms, and winterized and upgraded the tabernacle building. It still wasn’t the most elegant camp around, but it could easily accommodate at least 200 campers at a time in relative comfort. But really, it wasn’t the facilities that made Camp such an important part of my life. Rather, it was memories…. memories of fun, of friendships, and of important spiritual markers in my life journey. I remember so many fun times. When I was very young, the camp day started bright and early with the camp director, Rev. Campbell, trotting around the campground ringing an old cow bell! Everyone would groan, and most would turn over and snuggle into their sleeping bags for another hour of sleep. But the “old saints” would quickly arise, dress, and head down to the tabernacle in the early morning chill, where they would kneel on the cold floor, their elbows resting on the rough “altar call” benches stretched across the room below the stage, and start praying. Since my brother and I were instantly wide awake at the call of the bell, my mom would send us down to join the prayer meeting. She knew my grandfather would be there, and we would obediently kneel on each side of him, hands folded and eyes closed, except when we were peeking in wonder at what was going on. For those morning prayer meetings were a great wonder to a small child. The air might have been chilly, but those elderly people were on fire for their Lord! They had come to camp to meet God in a mighty way, and they were determined that everyone at the camp would have that experience. They would pray and call upon the Lord, till His presence in the room was unmistakable! I didn’t understand all that was happening, but, oh, I knew that God was real! Rev. Campbell would start ringing that old bell again just before 8 am and everybody would head to the dining hall for breakfast. We’d line up outside, and after all singing grace together – usually a rousing round of “For health and strength and daily bread, we give Thee thanks O Lord” – we’d file in, collecting a bowl of hot mush (porridge!) and a slice or two of toast, as we headed for the large picnic style tables with attached benches that each would seat at least 15 or 16 people. It was a great time of camaraderie. There would be one hired cook each year, but everybody pitched in and helped with cooking, serving, cleaning up, and doing dishes. So after each meal, the crew for that meal would head to the kitchen to do the dishes. It was great fun! In the early days before the government created endless bureaucratic rules, we’d line up at the two sets of sinks facing each other. On each side, one person would wash, one would rinse, and 2 or 3 would dry and put dishes away. There were always friendly towel fights, splashing each other, and other pranks. Everybody hated washing the silverware, and sometimes we’d have silverware wars, with the dishwashers tossing the silverware back and forth into each other’s sinks! We’d often all end up soaked, but it was fine! We lived in the sunny Okanagan, and we knew that we’d all dry off in short order. Then we’d head for the tabernacle for morning service. Everybody went; it was simply assumed that if you went to camp you participated in the services. We’d have a lively song service of favourite choruses and lively hymns. A missionary would get up and tell us stories from the mission field, always accompanied by a variety of realia, with the missionary often dressed in “native costume.” Always there was a long prayer, and then the children were sent off to “classes.” The teachers would prepare for months, and classes were sure to be well taught, with exciting story telling, felt board illustrations, and object lessons. It was a privilege to be a teacher at camp, and even though we didn’t have modern technology, every class was eagerly anticipated. There were always memory verse contests, and often by the end of a week or so of camp, we would have memorized at least 20 or 30 verses of scripture. Meanwhile, the teens and adults would sit under the teaching of Godly men who would take their listeners deep into the real meat of Scripture. Lunch would be like breakfast, except that there would always be an extra 20 or 30 or more folks than at breakfast, as local people would have arrived for the day. The final Sunday noon meal would be exceptional. There were always at least 250 or more folks! The food at lunch was always satisfying and delicious; homemade style casseroles, soups, buns and so on. After lunch was over and cleaned up, it would be “rest time” and the adults would try to catch a short siesta, while the children wriggled impatiently, waiting for the afternoon activity. Usually it consisted of everybody piling into cars, and driving in a long line down to the beach at Wood Lake for a swim. What fun that was! The afternoon temperatures could be in the high 90s or even over 100 (we still had Fahrenheit in those days!) and there was nothing like a good dip to cool off. The park we went to was quite small and we’d be packed in, splashing each other, tossing beach balls or Frisbees, and generally having a wild time. We didn’t need any fancy sports equipment to have a good time. Of course there weren’t any life guards; everybody just watched out for each other. If we had spare time before supper, when we got back to camp, we’d make our own fun, like heading off into the bush for a hike, or building “forts” in the woods near the camp. Those who were so inclined would head over to the tabernacle for choir practice. After supper and dishes, we would all head to our cabins and get changed for evening service. We never dreamed of going to “church” in casual clothes! And never would we wear “immodest” clothes! The girls all wore dresses, or skirts and blouses, and the boys all wore at least semi-dressy pants and shirts. The pastors and camp evangelist all wore suits and ties, though sometimes the ties got loosened and jackets set aside. There was no air conditioning of course, and all the windows and doors would be opened wide, and any loose scrap of paper would quickly be folded into fans. The teenagers would head for the back row, fondly referred to as “sinners row,” but would quickly be sent up to the front row by the older men. Children would sit with their parents, and all hoped their folks would choose a seat near the front where the action was. The service would begin with some rousing evangelistic hymns from the special “Songs of Old Time Faith” camp hymn book. Then there would be prayer, and more songs. The choir, which always had many eager members, would sing a special, always in at least 4 part harmony; something that would set the tone for the preaching, like that great hymn, “Wonderful Grace of Jesus!” And then the “evangelist” would get up to preach. And what preaching that was! Nobody could go to sleep during those sermons! The purpose of camp was to bring folks closer to God, and those old-time evangelists were “prayed up” and ready. By the time the evangelist finished his sermon, there would be tears all over the room. The music leader would lead the congregation in one of the great old invitational hymns, such as “The Old Rugged Cross” or “Pass Me Not O Gentle Saviour.” And the evangelist would urge folks to come forward to kneel at the benches, and “get right with God.” And those benches would fill up night after night. People would stay there until “the glory broke through.” For a young child, it was an amazing thing to see, an awe-inspiring sight, an understanding that God is real, and that He longs for folks to come to Him. After the service, it was back to the dining hall for hot chocolate and home-made cookies. Part of going to camp included every family bringing along a few dozen home-made cookies. Delicious! Then the young folks would head up to the campfire, where we’d all sing our favourite Sunday School songs and choruses to the tune of guitars and sometimes accordions or other instruments. Oh, how we enjoyed singing “I’ve Got a Home in Glory Land That Outshines the Sun!” and “Give Me Oil In My Lamp” and many another great old-time chorus. Finally we’d all head off to our cabins and tumble into bed, looking forward to morning and another great day. The final day of camp, after the evening service, we would all form a huge circle holding hands around the outer walls of the tabernacle – sometimes there’d be so many folks that the circle would be 2 or 3 times around – and we’d all sing “Till We Meet Again” or another similar song. Then we’d hug each other, and tears would flow, and we’d all promise to come back next year – and of course we did! I’m a bit embarrassed to admit that despite those wonderful camp meetings, somehow I really “didn’t get it” personally until I reached adulthood. Oh, I memorized loads of scripture, and knew all the hymns, and could explain the gospel well. And I never doubted that God was real, and I knew that eventually I would have to give in to His call! I did go up to the altar the summer I turned 13, and I really did want to follow the Lord, but somehow I wandered off the track. The gap between my head knowledge and my heart took a long time to be bridged. But in my mid-twenties, after the birth of my first child, the Lord finally got a hold of me, once and for all. And all those lessons that I had observed and learned in those wonderful camp meetings started to become real and alive in my own life. Well, over the years some things changed. The preaching got toned down, and worship bands took the place of the choir, and folks started wearing more casual clothes to evening service. The preacher became known as the “camp pastor” and required a microphone. Some folks thought that camp was a “vacation” and would skip a few services, and a few objected to helping with chores. Some thought that we needed a swimming pool and new, better beds and other facilities. Less folks turned up than in the old days, but right till the end, you could be sure of seeing certain folks there faithfully, year after year. One lady, “Sister Smith,” attended every single year for over 50 years – she was 103 years old at the last camp meeting! There were fewer altar calls, and a greater variety of afternoon leisure activities. The teenagers were given a cabin of their own to meet in, and both teens and children had their own “meetings” during the morning teaching time, while the children had “children’s church” during the evening sermon. Commercial DVBS materials were often purchased for the children’s classes, yet it became difficult to find volunteer leaders. The morning teaching service was sometimes replaced by a choice of seminars, which could include watching videos. The morning prayer meetings were dying down, but in the last 4 or 5 years, something of the old “Spirit” of camp was revived, and the prayer meetings and services started to regain the old spark, so to speak. Government rules and regulations made costs go up and up, and land taxes soared, as the camp that had been out in the country became the edge of the suburbs. Year after year, the camp had relied on donations. Everyone who wanted to come was welcome, and folks paid whatever they could, or came for free if they couldn’t pay. And year after year, the Lord provided. I don’t know for sure what happened in the end. Summer Family Camp for 2006 was announced, and folks were making plans, and then suddenly it was cancelled, as the camp facility was leased to another church group. I don’t know if this means that Pine Grove Family Camp is finished, or if God is just doing His work in a new and different way. But I do know that Family Camp will live on in my memory and in the memory of others as long as we live!